From the recently concluded April 2018 Technical Evaluation for Upgrading as Professional Electronics Engineers, the Professional Regulation Commission (PRC) already revealed the names of the successful passers. According to the commission, 67 applicants passed the technical evaluation for the upgrading to become Professional Electronics Engineer held this month. The Board of Electronics Engineering provided the technical evaluation in Manila. The designated personnel of the Board of Electronics Engineering headed by Engr. Alnar L. Detalla (Chairman of the board) and members Engr. Enrico Claro R. Delmoro and Engr. Herminio J. Orbe administered the applicants. From the latest shared information by the Professional Regulation Commission (PRC), it already revealed the names of those who passed the recent February 2018 Technical Evaluation for Upgrading Professional Mechanical Engineer. According to the commission, 37 applicants passed the evaluation taken on March 2, 2018 and held in Manila. The Board of Mechanical Engineering administered the Technical Evaluation headed by its chair Engr. Jesus M. Redelosa and the designated members of the board. 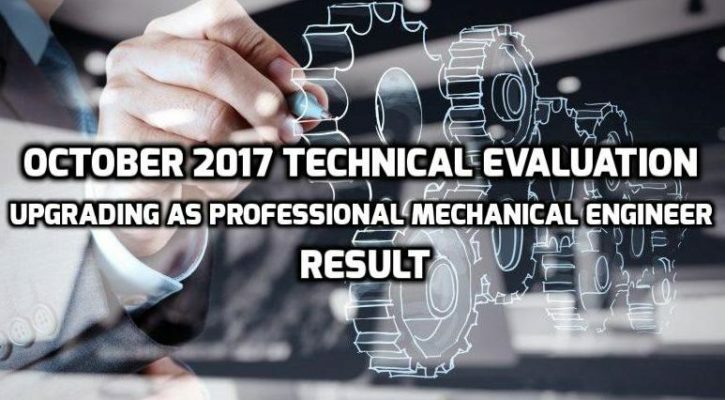 From the recent January 2018 Technical Evaluation for Upgrading Professional Mechanical Engineer held last month in Manila, the Professional Regulation Commission (PRC) already revealed the names of those who passed the evaluation. According to the commission, the Board of Mechanical Engineering administered the Technical Evaluation and about 73 applicants passed successfully. Chairperson and Engr. Jesus M. Redelosa headed the scheduled evaluation with the assistance of other designated board members namely Engr. Mirardo C. Malazarte and Engr. Fernando S. Guevara. 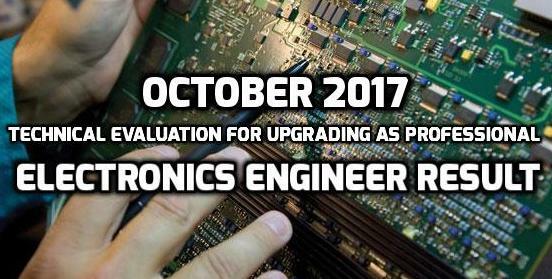 The result for the October 2017 Technical Evaluation for Upgrading as Professional Electronics Engineer is already available as revealed by the Professional Regulation Commission (PRC) through its online website. According to the PRC, 39 applicants who took the technical evaluation in Manila last month passed successfully. The PRC’s Board of Electronics Engineering administered the recent evaluation led by the chairman himself, Engr. Alnar L. Detalla and assisted by other board members Engr. Herminio J. Orbe and Engr. Enrico Claro R. Delmoro. The result of the October 2017 Technical Evaluation for the Upgrading Professional Mechanical Engineer held in Manila this month is available as released by the Professional Regulation Commission (PRC) on Monday. According to the PRC, 19 lucky applicants passed the Technical Evaluation successfully under the guidance of the Board of Mechanical Engineering chairperson and assigned members. Engr. Jesus M. Redelosa headed the evaluation and assisted by Engr. Mirando C. Malazarte Jr. and Engr. Fernando S. Guevara.